Since launching Lanie’s Hope in 2010, I have immersed myself in expanding my knowledge of the disease of compulsive gambling from one of personal experience to an intensive study of the science of addiction and recovery. I have been privileged to travel the country, learning from experts in the addiction treatment field, speaking to anyone and everyone impacted by the disease or open to having a meaningful conversation, and serving the compulsive gambler by participating in self-help group conferences and professional conferences. Bea Aikens – Advocacy speaking event. My experiences have shown me that change begins when we open our minds and hearts to understanding the viewpoints of others and find a common ground. As a nation, we are in the very early stages of taking this disease seriously. We are probably two decades behind other addictions with regard to national consciousness, conversations centered on service and treatment rather than judgment, and recognition that the compulsive gambler suffers from a treatable mental illness versus a moral weakness. It is our mission at Lanie’s Hope to “humanize and illuminate” the disease of disordered gambling, by being open to dissenting points of view, enlisting support and by speaking with those impacted by gambling disorder as well as those who impact gaming policy. Interestingly (and sadly) Lanie’s Hope’s website gets more “hits” on the topic of suicide than any other gambling addiction-related post. This unintended phenomenon is very telling and inspires me to continue my mission to help compulsive gamblers and their families, who desperately need resources. Some of them are contemplating or have attempted suicide, and others, thankfully, are looking for support resources and treatment, both of which are still in short supply. I recently met a man who’s sister was so worried about his suicidal thoughts related to his gambling addiction, that she feared he would succeed in killing himself before his gambling compulsion was arrested. She brought him to a self-help group conference in Florida, only to find he was not yet ready to stop gambling – even after several failed attempts at suicide. Addiction recovery coalitions and advocacy groups are beginning to include gambling disorder in their curriculum and systems of care. States like Nevada are allocating or re-allocating financial resources for treatment, education and awareness. And slowly, but surely, gambling addiction is being brought into the fold of addiction and recovery programs throughout the United States. In 2013, the American Psychiatric Association published the 5th edition of the Diagnostic and Statistical Manual of Mental Disorders; reclassifying the broad spectrum of gambling addiction (from compulsive to pathological) under the more comprehensive diagnoses of “gambling disorder.” Previously considered a Process Addiction (along with kleptomania and obsessive hair pulling known as trichotillomania) those impacted by gambling addiction have had few opportunities for treatment or support services. Gambling Disorder is the sole condition listed in the newly identified addiction class of Behavioral Addiction. According to the APA, this new term and its location in the new manual “reflect research findings that gambling disorder is similar to substance-related disorders in clinical expression, brain origin, comorbidity, physiology and treatment.” It is our hope that this new recognition, coupled with implementation of the 2008 Mental Health and Addiction Equity Act, will result in greater access to prevention and treatment, as well as heightened awareness. Our advocacy initiatives are growing from grassroots to a national level, with at least a glimmer of receptivity to beginning the conversation about gambling addiction as a mental health disorder. Hospitals have included Lanie’s Hope in their Mental Health Awareness programs, and some physicians have even added gambling activity questions to their patient intake questionnaires. This is a great start! But we need the voice of everyone impacted by gambling disorder to continue to advance the cause. Gambling is so deeply entrenched in our national norms that its prevalence mostly goes unnoticed. I have encountered gambling opportunities at church, in social settings and professional arenas. I recently participated in a survey related to my experience at an addiction advocacy program, only to be rewarded with the opportunity to WIN money for participating! Lanie’s Hope welcomes your advocacy, support, questions, and comments. 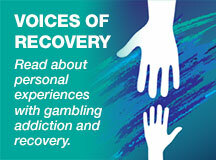 If you have had personal experience with recovery from a gambling addiction, please “share your story” on our website. Support Lanie’s Hope’s “Pay Hope Forward” and advocacy programs by contributing today. If you would like to start a dialogue on this topic, or have speaking opportunities, please call. And, if you or someone you love has a gambling problem…please call 1-800-522-4700 for 24/7 support.